Congratulations to Peter Eastgate, the 2008 WSOP Main Event Champion! It took four months, 39 two-hour levels of play, and a 104-hand heads-up duel to crown our 2008 World Series of Poker Main Event Champion. Peter Eastgate's name will be the next to be immortalized on one of those grand 20'x20' photos that will hang around the circumference of the Amazon Room at next year's WSOP, and carved into the history books alongside so many of poker's greats. Brunson. Moss. Ungar. Chan. Ferguson. Hellmuth. 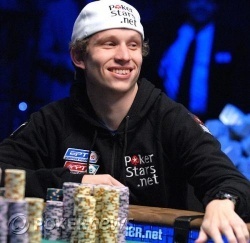 And now Eastgate, a 22-year old accounting student-turned-poker pro from Denmark. Speaking of Hellmuth, tonight Eastgate shattered a record that the Poker Brat has held for the last 19 years as the youngest WSOP Main Event winner in history. Eastgate is also the first Danish Main Event champion, as well as the fourth Dane to win a WSOP bracelet. Soft-spoken and a man of few words, Eastgate offered praise for his final-table opponents and predicted that he'd be seeing many of them again on the tournament circuit in the months and years to come. "I'm very proud and thank you all for coming," he said, smiling ever so slightly as he looked down at his new piece of jewelry. From all of us at PokerNews, thanks for tuning in. Our next stops will take us to locations as far-flung as Poland, the Philippines, and Mexico as the tournament circuit rolls on. Until next year, from the Rio in Las Vegas, good night, and good luck. Though his friends were smiling ear to ear, Eastgate was quite subdued in the moments following his win, wearing the same stoic gaze that he's donned all tournament. It was only when he walked behind the pile of cash on the table, picked up two bricks of it and held them aloft that the young Dane finally cracked a smile. Hand #274 - Ivan Demidov Eliminated in 2nd Place ($5,809,595); Peter Eastgate Wins the 2008 World Series of Poker Main Event! Peter Eastgate has the button. He limps in and Ivan Demidov checks the big blind. The flop comes down . Action is checked to Eastgate, who bets 1.25 million. Demidov calls, then checks again when the hits the turn. Eastgate doesn't slow down, firing out a bet of 2 million more. Demidov counts to twenty, then check-raises to 6 million. With that bet, he has committed half of his stack to the pot. It could be the point of no return if Eastgate comes along. Eastgate thinks things over for about thirty seconds and then calls. When he does, everyone in the gallery rises expectantly to their feet. The river is the . Demidov announces all in and Eastgate snap-calls. Could this be it? Demidov shows first, tabling for two pair, fours and deuces. Eastgate is next to show, turning over -- he's made a wheel! It's all over! Ivan Demidov has been eliminated in second place, earning $5,809,595 for his remarkable run through this tournament. Peter Eastgate has been crowned the champion of the 2008 World Series of Poker's Main Event. 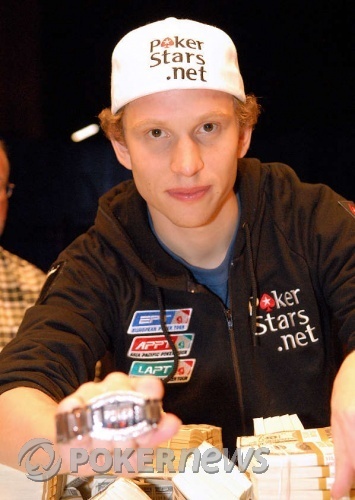 He is the youngest ever, breaking the record held by Phil Hellmuth, Jr. for the last 19 years. Cards are back in the air. Blinds remain at 500,000-1,000,000. Ivan Demidov has the button. He raises to 2,000,000, Eastgate moves all in and Demidov folds. Peter Eastgate has the button. He and Ivan Demidov both limp in and take a flop of . 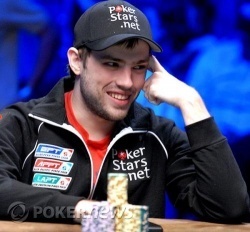 Demidov checks and then folds to a bet of 1.25 million. Eastgate has pulled away courtesy of those last two big pots and presently has a 6:1 chip lead over Demidov. Ivan Demidov has the button. He raises to 2,000,000 and Eastgate makes the call. The flop is and both players check. The turn is the . Eastgate leads out for 2.5 million and Demidov calls. The lands on the river and Eastgate puts out another 4.5 million. Demidov calls. Eastgate shows for threes full of eights and rakes in another substantial pot.